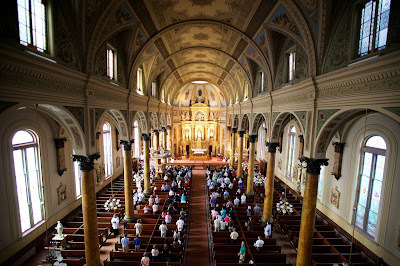 New Liturgical Movement: Grand Public Architecture: Why Is This No Longer the Operative Model? Grand Public Architecture: Why Is This No Longer the Operative Model? On a trip to Boston a few years ago — the first time I really made any effort to get to know the city — I was deeply impressed, not to say stunned, by the architecture with which this historic place abounds, particularly in its religious and cultural buildings that are intended for the general public. It got me thinking about how radically different was the attitude of our forefathers when it came to the erection and ornamentation of edifices. For them, public buildings are far more than the functionality offered by roofs, walls, doors, windows, and rooms. Such buildings embody and represent worthy ideals shared by many; they inspire viewers and impress visitors; they convey a sense of the grandeur of man's intellectual, cultural, and religious aspirations, which are the highest activities of the rational animal. These buildings are built to witness to a common vision of what is best as well as to help a society come to see what matters most. The gifts and sacrifices that make them possible are rewarded by the service (as it were) that these works of art subsequently render to the public, decade after decade, century after century, in both subtle and obvious ways. My example will be the Boston Public Library. As I gazed upon these wonderful buildings, which are so magnificent, earnest, orderly, serene, and pleasing, I kept asking myself: Why was it obvious to everyone to think this way about every public building, until the modernist revolution? It struck me, too, how often the conventions associated with ecclesiastical architecture supplied the vocabulary of secular buildings -- note the barrel vaulting and apse-like set-up of the reading room, or the courtyard so reminiscent of a monastic cloister. As long as the Christian faith is either in the ascendent or at least pervasive in a society, it permeates the art and draws it upward to itself, introducing analogues of the sacred at every level. If I may borrow a phrase dear to David Clayton, we are seeing the Way of Beauty in action: daily life, profane life, is being ennobled, elevated, and enriched by its association with the transcendent, the religious, and, in some cases, the explicitly Christian. For evidence, compare these next photos, taken in churches, with some of the photos above. It is evident that the secular and ecclesiastical styles are not so much different languages as different dialects of the same language. What happened shortly before, during, and for many decades after the Second Vatican Council was quite the opposite. A secular world already in self-chosen free fall was tearing apart the aesthetic conventions of centuries and replacing them with self-inflated exertions of willful modernism -- anything could be attempted, so long as it did not suggest the old days and the old ways. Shamefully, we saw the emergence of countless new churches that inverted the proper relationship of sacred and secular completely by submitting to the new modernist paradigm, which was flagrantly anti-Christian. The profane now dictated to the sacred how it was to manifest itself, and the latter plummeted into ugliness, banality, sterility, and emptiness. Almost every building from this period now looks dated, dull, and depressing, having lost whatever momentary revolutionary appeal it might once have had. Its appeal was that of the shock of novelty, and novelty doesn't take long to wear off. Meanwhile, people in their millions continue to visit the timeless shrines of the Christian West, Chartres, Notre Dame, St. Mary Major's, St. Peter's, and on and on, because these buildings were built not for the thrill of transgression or the kick of a concept but for Almighty God and for Christ the King and for His All-Holy Mother and for the devout faithful. As NLM authors have shown in occasional articles on "The Other Modern," and as we all know from experience, modern architects did not always succumb to the temptation to sever their ties with the cosmos, human nature, and tradition, and more recently, in certain countries and dioceses, we have seen a repudiation of this dead end and a return not only to the classical architectural tradition but also to the underlying metaphysical and theological framework that sustains it. 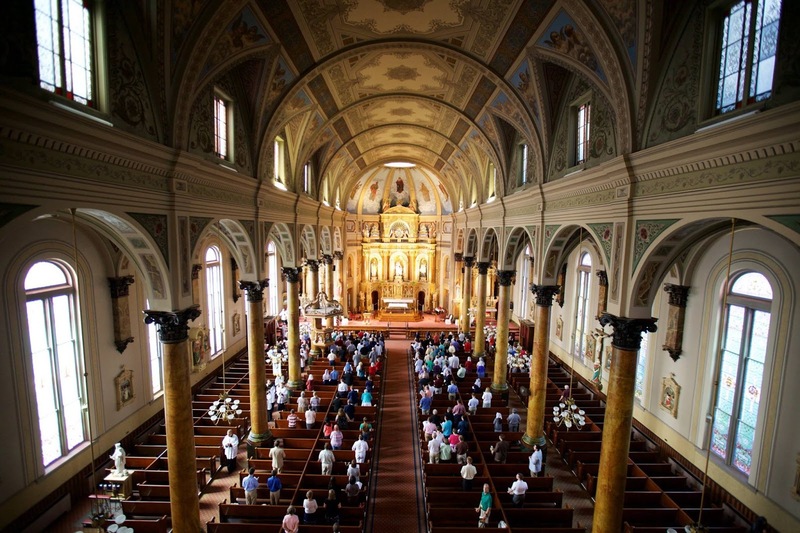 As surprising as it may seem, today's church architects and renovators could do much worse than to visit great secular buildings like the ones featured above, and to ask themselves how the human spirit expressed in their lines, forms, and colors could be matched by superior and more specific analogues in the temple of God. After all, the church, too, is a grand public building, born from and in service of a society -- the Mystical Body of Christ -- and it should look like what it is.